It doesn't matter if she's writing romantic suspense, paranormal or straight contemporary; Virginia Kantra is an anto-buy author who has never let me down. Her skillfully crafted, character-driven stories and knack for creating a vivid sense of time and place bring readers into the heart of her stories and the hearts of the characters who populate them. Carolina Home introduces us to the Fletchers, a blue collar family from Dare Island, a fishing village off the coast of North Carolina. Like many young people from Dare Island, Matt Fletcher left for college seventeen years ago with dreams of a life beyond his small hometown but his dreams were derailed when his college sweetheart became pregnant. They married but his rich, pampered wife wasn't ready to set aside her dreams and bailed on Matt, their baby son and their marriage. For a man to whom family is everything, this was completely unthinkable. Matt left school and brought his baby son back to Dare Island and the love and emotional support of his family. Now the captain of a fishing boat, Matt helps his parents with their inn, is a single dad to his sixteen-year-old son and though he enjoys no-strings dates, isn't about to offer his heart up to be trampled upon again...especially not to a gorgeous young woman with the same spoiled background as his ex-wife who, odds are, won't last beyond one winter on the isolated island. Allison Carter knows she's considered an outsider on Dare Island. After all, most families in the tight knit community have been there for generations while Allison can count her tenure in weeks. But that doesn't mean that the young English teacher won't stay. The daughter of wealthy parents more interested in their social calendar than the happiness of their children, Allison has been searching for a home her whole life and Dare Island is where she plans to put down roots. She knows about Matt Fletcher and his serial dating past and has no interest in becoming another in a long list of "women who once dated Matt Fletcher" but she isn't prepared for the instant attraction to the man when she contacts him about problems his son is having in her class. Matt sure has no plans to become involved with his son's teacher but circumstances keep bringing them together and the more time they spend with one another, the more they begin to see that there's more to each of them than the preconceived opinions each had of the other and, more importantly, they begin to discover that, together, each of them becomes more. When Matt's troubled young niece, a child none of the Fletchers knew existed, appears on their doorstep, it's Matt who she seems to trust the most and Allison is the person Matt turns to for support and advice, bringing the two of them closer and drawing Allison even deeper into the heart of the Fletcher family. The journey, however, for Matt, Allison and the entire Fletcher family isn't without some some significant bumps along the way, including the unexpected appearance of Allison's controlling, elitist parents and a near-tragedy that shakes the Fletchers to their bones. I loved this book! While we never lose sight of the fact that this is Matt and Allison's book (and their's is a wonderful, emotionally satisfying story), there's so much more to Carolina Home than only the two of them. There are the people who live in Dare Island, the new and recently returned characters of whom we are sure to see more in upcoming books; the emotionally fragile little girl newly discovered and her tenuous tie to a military father with no clue what to do with her and Matt's son Josh, an engaging young man teetering on the edge of manhood. Then there's the hard-charging, work-til-you-drop executive sister whose life is turned on it's head and finally, at the center, Tess and Tom, a loving couple whose bond is solid as a rock and who are the heart and soul of this strong, supportive, very special family. I fell in love with all of them and can't wait for my next visit. Don't worry about keeping track of all the characters. Each of their roles is necessary to the complete story and Kantra weaves them in and out expertly. They are not characters who only make an introductory appearance to get you ready for future stories. They are essential family members who have a place and purpose and the story would not be complete without them. While making your reading travel plans this summer, be sure to include a trip to the Carolina coast and Dare Island with Carolina Home. I highly recommend it. Because I loved this book so much, I'm giving away a copy to one randomly chosen person who leaves a comment today. Tell me about your favorite fictional families. What are the books on your summer "must read" list? Have you read Virginia Kantra's books before? Which ones are your favorites? Ever been to the Carolina coast or the Outer Banks? Let's dish! Favorite fictional families? Julia Quinn's Bridgertons, Julie Ann Long's Redmonds and Everseas, and the founding families in Jodi Thomas's Harmony series. Among the must read romance books on my summer list are Thief of Shadows--Elizabeth Hoyt, Dream Lake—Lisa Kleypas, Sweet Deception—Heather Snow, Ravishing the Heiress—Sherry Thomas, The Great Escape—Susan Elizabeth Phillips, Scandal Wears Satin—Loretta Chase and The Duchess War—Courtney Milan. I haven't read Virginia's books yet, but I've been meaning to. Thanks for giving me another good reason to read them! Love the Bridgertons, Redmonds and Everseas! I've been collecting the Harmony books but haven't started reading them yet. THIEF OF SHADOWS was fabulous! Did you notice in "News and Notes" that Elizabeth Hoyt will be visiting with us next week? We're so excited! I'm looking forward to all the books on your list and looking for time to read them all! lol! What a lovely review! Thank you, PJ! And LSU, I hope you get a chance to read Carolina Home! PJ, I love Virginia's books. I've been a fan since The Reforming of Matthew Dunn, her first Intimate Moments. I'm very much looking forward to reading Carolina Home. The Outer Banks setting is also a big plus. Our family has gone to Nags Head for vacation several times and enjoyed it immensely. There's so much to do--Ft. Raleigh, the botanical gardens, the aquarium, The Lost Colony play, and of course, the beach. We drove down to the Hatteras light one year. It was cool. Nancy, I'm a Long time fan of Virginia's books too. I discovered her when she was writing category, followed her through romantic suspense and paranormal and adore her new contemporary series. Aw...Thank you! I've started to bring out my backlist for Nook and Kindle, lightly edited and updated with lovely new covers. I think the Dare Island books are much closer in tone to those earlier Intimate moments, particularly The MacNeills. Nancy, I hope you enjoy! Carolina Home was the first book I reached for when I sent my last article to my editor yesterday. I'm finishing the book today and loving it as much as you did, PJ. My first Kantra book was Mad Dog and Annie in 2000, and it's still an all-time favorite and one of the best romances involving domestic abuse that I've read--and I've read a lot of them. I immediately glommed the other MacNeil books, and I've been a Kantra fan ever since. I enjoyed her Children of the Sea books, but I'm delighter to see her return to the small-Southern-town setting she does so beautifully. I have so many favorites families. I could probably list twenty-five or so easily, but I'll stop with my top five: Nora Roberts's Quinn brothers, Eloisa James's Essex sisters, Anne Gracie's Merridew sisters, Lisa Kleypas's Travis family, and Julia Quinn's Bridgertons. And the book of summer I'm most looking forward to now is actually a September release, but an ARC is already on my Kindle and I am anticipating a few lovely hours with it this weekend--Seven Nights in a Rogue's Bed by Anna Campbell. I'm also looking forward to reading SEP's The Great Escape and Lisa Kleypas's Dream Lake. Mad Dog and Annie was such a good book. I think you might be the one who recommended it to me, Janga. I adore the Quinn brothers! Also the other ones you listed and I'm looking forward to those books you have on your tbr list! 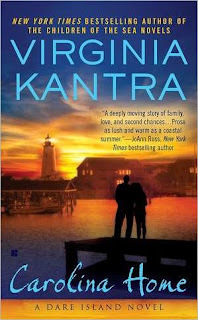 Regencygirl, you're in for some wonderful reading when you pick up any book by Virginia Kantra! Cynsters, and Bridgertons, and The Maiden Lane Family, OH MY! PJ, there are just too many families to love. What about the Forsyte's and the People from Downton Abby, not to mention the Montagues and Capulets! This sounds like an emotional book but one with some happiness in store too. It sounds like a place to raise families just because it's cozy and seemingly picturesque. One of my favorite families is Jude Deveraux's Edileans. Everyone is so quirky, has their secrets but they sure stick together, even if it's cousins or further. I like the bond they have. I'm afraid I haven't read her as yet but they do sound like everyone likes her stories. I've not visited the Outer Banks but I do know of others that have loved it. As to families, I'm just horrible at remembering names lol. I am getting Dream Lake and have Thief of Shadows on the top of my TBR pile. Currently I am reading Kris Kennedy's Defiant - love her books. I'm looking forward to Dream Lake. Thief of Shadows was wonderful! Elizabeth Hoyt will be visiting with us next week. And Kris Kennedy (one of my favs) will be here in August! I think you'd like this one, Trisha! Oh, and The Duke and I wasn't my first romance but it was my first Julia Quinn book. I adore it! PJ, you know how much I love straight contemporaries, so this one sounds PERFECT! Thanks for the great review! Love the Quinn brothers and Nora's MacKade brothers, too. She's one of my favorites too, Beth. Such a wonderful writer! I've never been to either of the Carolinas. I've heard the northwestern mts of NC and beaches around Myrtle Beach, SC are gorgeous. I haven't read any of your books yet Virginia. Laurie, western North Carolina is some of the most beautiful scenery I've ever seen. Have you seen Last of the Mohicans? Much of that gorgeous movie was filmed in western NC. I haven't read any of Virginia's books yet, but would like to. I like Carly Phillips' Serendipity series about brothers. The Serendipity books are so good! Patty - thanks for introducing me to this author. I'm looking forward to reading this series and following this family! Kayjax, I think this is one you're really going to enjoy! It's been a long day... can I blame brain fatigue if I can't come up w/ any good book families that haven't already been mentioned? I've been in a PNR kick lately and the historicals that I've read have all been stand alones. Sorry! No worries, Erin. We're well acquainted with brain fatigue around here! I have the CHILDREN OF THE SEA series, but didn't realize until I checked her website that there are two related stories in anthologies. I'll have to track those down. I didn't realize she had this series out. I will definitely be getting them. We went to the Outer Banks many years ago when our children were still in school. Kill Devil Hill was the highlight of that trip. We have stayed on the coast several times, usually around New Bern. about 3 or 4 years ago, our nephew got married in Beaufort, SC in the city park by the water. The brides family gave a crab boil the night before, and we enjoyed walking around the town. Unfortunately, it was hot and humid that trip. We spent a day in Charleston, SC, but didn't do or see much. When we turned to the Weather Channel that morning, their reporter was standing near a fountain in town saying it was going to be 115 degrees that day with the heat index. It was. We tried to walk around and see the sights, but it was just too hot. We gave up, had lunch at an air conditioned restaurant and went to see an IMAX movie. We plan to go back during cooler weather and spend some quality time there. Pat, I love the Children of the Sea series. She hooked me with the very first story and kept me glued to the island through the entire series. Charleston and Savannah are both fascinating cities to explore. Fall is a lovely time to go. I love Quinn's Bridgertons, Kleypas' Hathaways, Travises and Nolans like they were more than fictional families. My TBR book list for the summer is so long that's scary! But Virginia Kantra will make it to a pole position 'cause I love simple but poignant love stories and the cozy feeling of a small town romance. Virginia Kantra will make it to a pole position 'cause I love simple but poignant love stories and the cozy feeling of a small town romance..
Everyone has mentioned all my favorite families & I've added a few to my list to check out. I have not yet read of Virginia Kantra's books. CAROLINA HOME does look wonderful. I hope you give it a try, Marybelle. Do you read Kristan Higgins? I think she writes some of the best contemporaries out there and she raved about CAROLINA HOME on my facebook wall yesterday. High praise! I spent many summers in the Nags Head area of North Carolina. We owned a home in Kitty Hawk and would head down from our home in the Tidewater area of Virginia to spend weekends and as many weeks as we could basked in the lovely Outer Banks area. There is a different feeling in the air of that area. It's a laid back, happy and friendly place. One couldn't help but be relaxed there. I'm very intrigued by the characters and the plot of "Carolina Home" and am very much looking forward to reading it and being transported back to a beloved place - the Outer Banks. My favorite fictional families are the Bridgertons and the Hathaways. I'm reading Sherry Thomas's books and the Fitzhughs are interesting, too.